Howard Elsberry, president and CEO of Westlake Hardware, Inc., will deliver the Truman commencement address at 2 p.m., May 13, at Stokes Stadium. A reception will follow at Red Barn Park. Elsberry earned his degree in business administration from Northeast Missouri State College in 1964. Immediately after graduation, he joined T.G. & Y where he worked his way through their management training program. In 1966, Elsberry left T.G. & Y to join Westlake Hardware, based in Moberly, Mo. He began his Westlake career as assistant manager at Columbia, Mo. Two years later, he opened the Westlake in Fulton, Mo., and stayed as store manager there until 1975. At that time, Elsberry was promoted to vice president with duties in special projects, store supervision, warehousing and transportation, and real estate. In 1988, he was named chairman of the Board of Directors' Executive Committee. In 1989, Elsberry was promoted to executive vice president and chief operating officer. He was elected president and CEO in 1991, when Westlake had 47 stores and annual revenues of $106 million. During his leadership, sales have doubled to $215 million while the store count has increased by 76 percent. 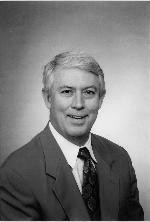 In addition to his duties at Westlake, Elsberry is a member of the Missouri Chamber of Commerce, where he is also past chairman. He served for many years on the Hawthorn Foundation. Elsberry and his wife, Anne ('64), are active supporters of numerous charitable organizations in the Kansas City area. Ryan Brennan, principal for Advantage Capital Partners, is pictured at the recent Foundation Banquet with University President Barbara Dixon. Brennan presented a keynote address at the banquet and also informed the University of a $40,000 gift to benefit Truman's Missouri Government Internship Program. Truman State University alumni Scott Zajac ('83) and Ryan Brennan ('95) along with their company, Advantage Capital Partners, have made a gift of $40,000 to establish an endowment to benefit the Missouri Government Internship Program. Zajac, the firm's senior managing director, and Brennan, principal, are both former participants of the program that annually sends Truman juniors and seniors to Jefferson City for a semester internship with a legislator, public official or state agency. "Truman is delighted to receive this investment in one of our most distinctive co-curricular student programs," said University President Barbara Dixon. "The endowment will expand opportunities for students and provide a solid financial base for the future." Earnings from the endowment will be directed to stipends received by program participants, used to defray housing and living expenses incurred during the semester. The Truman State University Foundation also supports the program through unrestricted gifts. The gift will also be used as a catalyst to seek additional endowment support from other program participants and corporations with mutual interests, according to Mark Gambaiana, vice president for University Advancement. An estimated 500 Truman students have participated in the program since its inception in 1972. Formed in 1992, Advantage Capital Partners is a private equity firm that invests in promising companies in connection with federal, state and local economic development initiatives. With offices in St. Louis, New Orleans, La., and several other cities, the firm has raised more than $700 million in institutional capital. 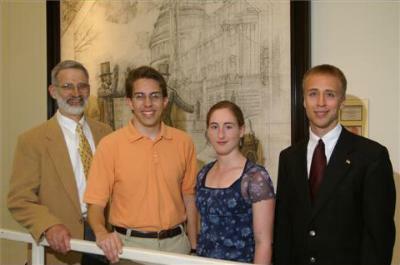 Chett Breed, (left) professor of English, announces (second from left to right) Brian Robert Rose, Jessica Bennett and Robert Kelchen as winners of the Schwengel Lincoln Competition. The Truman State University Division of Language and Literature and Division of Fine Arts have recently announced the winners of the annual Schwengel Lincoln Competition in essay, oratory and art. In the essay category, Jessica Bennett, a senior communication major from O'Fallon, Mo., earned first place with her work titled "Pennies and People." Brian Robert Rose, a senior history major from Shawnee Mission, Kan., earned second place in this category with his essay titled "Shades of Lincoln." The winner of the oratory category was Robert Kelchen, a senior business administration and economics double major from Hiram, Ga.
Students entering the competition had to use an informed understanding of former United States President Abraham Lincoln and of the selected excerpted passage from "Encounters with Lincoln," a book recently published by Thomas Trimborn, professor of music, to prepare a 1,000-1,500 word, 3-5 page essay, a speech of the same length or an artistic work. The winners in each category received a $300 cash prize or a trip to Washington, D.C. The Schwengel Lincoln Collection was established by alumni Fred D. ('30) and Ethel ('32) Schwengel in 1976. The Schwengels donated an outstanding collection of artwork, books, and memorabilia devoted to the 16th President. Now numbering in the thousands, the collection celebrates the life and ideals of Abraham Lincoln. The Schwengels established the Schwengel Lincoln Foundation in conjunction with the collection to inspire future generations with the ideals and values of Abraham Lincoln. Since 1977, the Foundation has underwritten a contest in art, oratory, and essay writing on a Lincoln-related theme. The contest, held each spring, is administered by the Fine Arts and Language and Literature Divisions, and is open to high school as well as college level students. Some of the prize winning entries of past years may be viewed in the Schwengel Lincoln Collection. The Schwengel Lincoln Collection is located in Pickler Memorial Library on the campus of Truman State University and is open to the public free of charge. The permanent art exhibit, in the lounge and gallery areas on the third floor, is available for viewing whenever the Library is open. Special exhibits are occasionally mounted in the first floor gallery as well. The book collection is in the Special Collections Department, just off the third floor gallery. Identification, such as a student ID or driver's license, must be presented when requesting use of these materials. For a complete listing of library hours, check the library Web site at http://library.truman.edu. For contest information, contact the Division of Language and Literature at 785.4481. 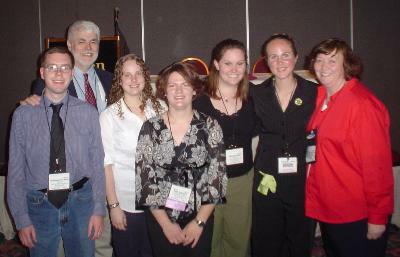 Students and mentors gather at the recent National Science Teachers Association meeting (left to right) Christopher Maher, John Hoffmann, Katherine Schottmueller, Ruth Delaware, Alexandra Kiefe, Chelsea Haas and Lin Twining. Truman State Univeristy students, Ruth Delaware from Kirksville, Chelsea Haas from Dunlap, Ill., Alexandra Kiefe from St. Peters, Mo., Christopher Maher from St. Peters, Mo., and Katherine Schottmueller from Florissant, Mo., presented the results of their research project, "Survey of Attitudes in and Teaching of Evolution by Science Teachers in Northeast Missouri," at the national meeting of the National Science Teachers Association (NSTA) in Anaheim, Calif., on April 7. All of these students are biology majors and pre-service MAE students. Their study found that science teachers in northeast Missouri do indeed feel pressured to include creationism/intelligent design, or to omit evolution from their teaching. Teachers reported that the source of this pressure is students and parents, rather than school administrators or school board members. These students also presented their results at Truman's Student Research Conference. John Hoffmann, professor of education, and Lin Twining, professor of science, served as faculty mentors for the project. The students are members of Truman's NSTA student chapter. Their research project and travel to the meeting was generously supported by the Divisions of Education and Science. Elizabeth Hobbs, a senior biology and pre-education major from Newton, Kan., ranked fourth nationally April 22, at the prestigious Interstate Oratorical Contest, hosted by the University of West Florida, in Pensacola, Fla. Her performance is Truman's best in the recorded history of the forensics program and one of the best performances from a Missouri student in recent memory. The Interstate Oratorical Contest is widely considered to be one of the most challenging contests of its kind. Each state may send no more than two students, usually selected at their State Championship Tournament. Hobbs qualified through the Missouri Association of Forensic Activities Championship in February. This year's contest included 49 competitors from 28 states. Among the best-known former Interstate Oratory contestants (and ones who did not win), include former secretary of state and presidential candidate William Jennings Bryan, former senator and presidential candidate George McGovern, and former Vice President Hubert Humphrey. Past winners include Sen. Robert M. La Follette, a prominent leader in the Progressive Movement of the early 1900s. The contest has been held annually since 1875. Hobbs' speech condemning the practice of extraordinary rendition by the United States government received widespread praise by the contest's judges and found itself in strong company in the final round with contestants from Kansas State University, Bradley University and Morehouse College. This concludes the 2005-2006 forensics season. 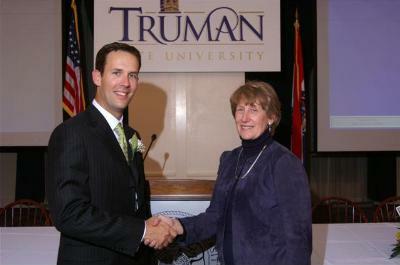 Truman will resume competition in the second weekend of September 2006. As of May 15, Jason Miller, associate professor of mathematics, and Maria Nagan, assistant professor of chemistry, will officially become the project director and co-director, respectively, for Truman's Science, Technology, Engineering, and Mathematics Talent Expansion Program, better known as STEP. Jeffrey Osborn, professor and convener of biology, has headed the program since its inception in 2004, and was instrumental in winning the $2 million, five-year award from the National Science Foundation. Osborn has recently accepted the position of Dean of the School of Science at The College of New Jersey. STEP is one of the largest and most prestigious awards Truman has ever received. It supports undergraduate research and draws faculty and students from three community college partners in Moberly, St. Louis and Kansas City, Mo., to Truman's campus. One of the primary goals of the STEP program is to increase the number of talented community college students who transfer to Truman, and to ensure that these students graduate with science, technology, engineering and mathematics degrees. STEP also provides faculty-mentored summer research opportunities for Truman students and offers a variety of other opportunities for curriculum enrichment and faculty development. Applications for the new 2006-2007 Lyle Ingraham Scholarships are now available online. Current freshmen, sophomores, juniors and seniors at Truman are eligible to apply. According to scholarship guidelines, the maximum annual award per student is $4,000. Criteria include financial need and leadership and potential for academic success. Students must be full-time and in good academic standing to receive the scholarship. The Lyle Ingraham Scholarship fund is designed to assist students with financial need to attain a Truman State University education. The fund was established through an estate gift of $3.44 million by Lyle Ingraham, a native of Green Castle, Mo., who passed away on July 3, 2005, at the age of 99. To apply, please go to https://secure.truman.edu/isupport%2Ds/scholarships.asp. The deadline for applications is midnight, May 7. Recipients will be notified and their names will be posted on the Foundation scholarship Web site by the end of May. And also, a free alumni gift bag full of alumni gear – T-shirt and more! If you cannot join us for lunch, stop by the Office of Advancement, McClain Hall 101 and pick up your free alumni gift bag. For more information contact Denise Smith, manager of alumni relations, dlsmith@truman.edu or Greg Xander, alumni relations assistant, gregx@truman.edu 785.4133 or 800.452.6678. Tickets are free with with student ID and $5 for general admission. Tickets are available at the SAB Office located in the SUB Governors Room. SAB reserves the right to open to the public all seats not occupied five minutes before showtime. Tickets do not guarantee a seat after this time. Backpacks, food and drink (including water bottles) will not be allowed in Baldwin Auditorium. Kenneth Carter, professor of chemistry, presented an invited paper, "From Patients of Teaching to Agents of Learning," at the 231st National Meeting of the American Chemical Society in a symposium devoted to Process Oriented Guided Inquiry Learning (POGIL). The American Chemical Society is the world's largest scientific society. Laura Keck, a senior political science and sociology/anthropology double major from Quincy, Ill., and Terri Rott, a senior communication major from St. Louis, have each been awarded an 1843 Deans Scholarship to the Saint Louis University School of Law. Keck and Rott were selected to receive the scholarship from a pool of 28 finalists. The prestigious 1843 Scholars award is granted to just 10 incoming Saint Louis University Law School students each year and is a three-year, full-tuition scholarship. Chenghu Li, a sophomore physics major from Jefferson City, Mo., and Matthew Beaky, associate professor of physics, presented the results of research conducted at the Truman Observatory at the 2006 Mid-American Regional Astrophysics Conference in Kansas City, Mo. Li's presentation was titled "Neglected Binary Star Parameters Determined from Archival Images and Direct Observation," and Beaky spoke on "Detecting Extrasolar Planetary Transits Through Photoelectric Photometry." The latter project described work carried out by Violet Poole, a senior physics major from St. Charles, Mo., as part of the summer 2005 Next STEP Program. Truman's NSSHLA chapter, the Communication Disorders Association (CoDA), hosted a Spring Workshop on Feb. 17. Angela Saus, M.A. CCC-SLP and Denise Sangoi, B.S., OTR/L made a presentation on "Organize and Puzzle: An Integrated Approach to Treating Communication Disorders and Sensory Needs." The Society of Physics Students (SPS) has recognized Violet Poole, a senior physics major from St. Charles, Mo., as one of the SPS 2005-2006 Leadership Awardees. Poole was selected from a group of exceptional applicants for her outstanding academic performance and high level of SPS activity. She will receive a scholarship in the amount of $2,000. The SPS plans to feature its scholarship winners on its Web site at http://www.spsnational.org/programs/spsscholarships.htm and possibly in an upcoming article in the SPS Observer newsletter or in the Radiations magazine. John James Quinn, associate professor of political science, and his co-author, David Simon from Yale, had their article "Plus ca change, . . . : The Allocation of French ODA to Africa During and After the Cold War" accepted for publication in International Interactions. Mark Spitzer, assistant professor of English, recently had his book "Riding the Unit: Selected Nonfiction 1994-2004" accepted for publication by Six Gallery Press in Pittsburgh, Pa. The Psychology Capstone Research Presentations will take place from 1-5 p.m., May 2, in the SUB Activities Room. Senior psychology majors will be presenting the results of original research in poster format. For more information, contact Karen Smith at 785.6033. The DEPThS group will meet at 8 p.m., May 2, in BH 249. E-mail depths.tsu@gmail.com for more information. The Center for Teaching and Learning Weekly Lunch Series will conclude the semester from 12:30-1:30 p.m., May 3, in the SUB Spanish Room. Call 785.4391 for more information. The Environmental Campus Organization (ECO) and Kirksville Arts Association are hosting the first ever ARTSEnvironmental Gallery Show now through May 4. For more information, e-mail Cassie Phillips at cassiephillips@care2.com. The Rho Omega chapter of the honor society of nursing, Sigma Theta Tau International (STTI), is sponsoring the Truman State University Capstones of Nursing on May 4, on the third floor of the SUB. The event begins with registration and poster displays at 9:30 a.m. followed by the keynote address at 10:15 a.m. The keynote speaker is Constance Brooks, assistant professor of clinical nursing at the University of Missouri-Columbia's Sinclair School of Nursing. Her address is titled "Relationship-Centered Communication." The keynote address is free and open to the public. Lunch will be served at 11:45 a.m., followed by the afternoon sessions featuring many interesting speakers on topics in nursing including mental health, epidemiology, pediatrics, Ob/Gyn, women/child, interdisciplinary health care, study abroad nursing and more. The cost is $10 for lunch only, $20 for STTI members and $30 for nonmembers. Cost includes refreshments and conference materials. Register through the Division of Nursing at 785.4557. Tag Improv will perform for the final time this year from 8-9:30 p.m., May 4, in the SUB Room 208. The performance will include comedy improv, sketch comedy and musical guests. For more information, contact J.C. Scholfield at 314.494.8687 or tagimprov@truman.edu. The Observatory will be open to the public, weather permitting, from 9-11 p.m., May 4, at the University Farm. Go to http://observatory.truman.edu for more information. The American Association of University Professors (AAUP) will meet at 4:30 p.m., May 5, at the University Club. Contact Marc Becker at 785.6036 for more information. Truman's chapter of Circle K is hosting a rummage sale from 6 a.m.-2 p.m., May 6, at the commuter parking lot located at the corner of Patterson and Franklin Streets. Proceeds from all sales will benefit Kirksville's Preferred Family Healthcare, a nonprofit organization that offers substance abuse healthcare services. The club asks Truman students, faculty and staff and Kirksville residents to donate items for the sale. Most items will be accepted, including books, clothing, furniture and more. Item pick-up and storage services will be available for those who need them. Circle K also encourages members of the Kirksville community to support Preferred Family Healthcare by purchasing items at the event. For more information, contact coordinator Liz Raine at ecr939@truman.edu or 785.5483. This year's annual boiler shutdown for maintenance and inspection is scheduled for May 16-26. The campus will be without steam for building heat and hot water throughout the shutdown period. It is anticipated that the boilers will be back on-line by the afternoon of May 26. If you have any questions regarding the shutdown, or if you have schedule conflicts to address, please notify the Physical Plant Office as soon as possible as 785.4200. The 2006 Homecoming committee is looking for faculty, staff and administration volunteers to judge the events to take place Oct. 16-21. Judges will be needed for every day with the exception of Wednesday. For more information or to volunteer, contact Logan Johnson, the points and awards co-chair for the 2006 Homecoming festivities, at 665.9622 or ldj858@truman.edu.